Dead Space 2 has landed, bringing a new Isaac Clarke adventure complete with necromorphs, hallucinations and many dark rooms. Does it fix the problems and shortcomings of the prequel, or were the criticisms ignored? Isaac wakes in a hospital on the Sprawl, a huge space colony built on Titan, one of Saturn's moons. Strapped into a straight jacket, Isaac is pretty much a fish out of water. A helpful, terrified man comes to your rescue, warning of terrible danger. As he is doing so, a necromorph silently approaches and impales him through the chest and face. In what is one of the most mind-blowing gaming moments of 2011 so far, the man then transforms, inches from Isaac's face, into a necromorph. It is brutal, graphic and truly amazing. The next sequence is reminiscent of the Mass Effect 2 section which sees you playing as Joker. As you gain control of Isaac for the first time, you make your way through a small section of the Sprawl, and scripted events happen on either side and around every corner. Necromorphs kill, humans transform, explosions and destruction is constantly happening. 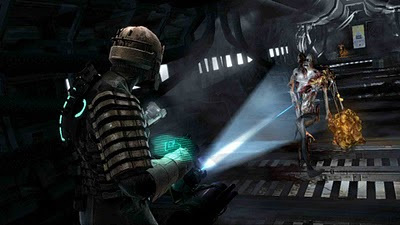 These amazing set pieces continue to pop up throughout the campaign, and really make Dead Space 2 standout as not only one of the most atmospheric and action packer horror games, but as one of the best games available. The gameplay is also excellent, and truly suits the genre. It is a third person game, and the camera looks over Isaac's right shoulder. The camera is quite close to the character, and doesn't allow you to move it all the much. 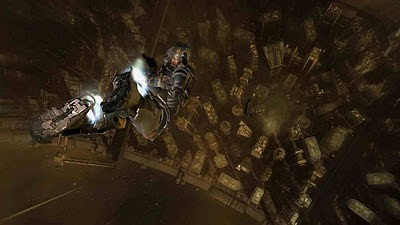 You can move it 360 degrees around Isaac, but where in other games you might be able to peer around corners without actually being at the corner, you cannot in Dead Space 2. Visceral wanted each and every scare to be a shock, with no scouting ahead. There is no HUD in the game, with the relevant information instead being shown in-game. Ammo count and messages are displayed with holograms, whilst your health and stasis count are attached to the back of your suit, in the form of lights. Again, it works well as it destroys the usual HUD borders and makes the game all the more engrossing. There are a few gameplay mechanics that are used a few times, but they aren't overused. For example, every now and then you will come to a zero gravity section. You are free to move up, down, sideways and are able to rotate Isaac. Every time you experience zero gravity, it is better than the last. Where you may use it in one room near the start, further into the game you will be hurtling through space, with no sounds but Isaac's breathing. The lack of music and almost all sound makes these sections truly breathtaking and cinematic. There are also puzzle sections, usually involving the use of your kinesis grip and fuses to unlock doors and restore or deplete power. Again, these sections are a nice change of pace and are not overused. Dead Space 2 definitely rewards exploration. Hidden items, ammo and credits, as well as the valuable power nodes can be found in rooms not relevant to your objective. So it's your choice. Do you enter the room with the potential to make you scream for what could be nothing, or do you walk on by and maybe miss a power node? Visceral Games have created one of the best games of this generation. It’s a perfect mix of action, horror, adventure, puzzles and survival, and should be played by everyone. Awesome set pieces, beautiful vistas and enough scares to keep you busy for a long time, this game is everything it needed to be, and more. The Super Hero Squad Show giveaway!